Time to start thinking about leisure time, outdoor sports and the next vacation. To get ideas or just enjoy the fun parts of two, get-out-and-do-something shows, check out the The Chicago Boat, RV & Sail Show that takes over McCormick Place’s South building Jan. 9 through Jan. 13 and the Chicago Travel and Adventure Show that moves into the Donald E. Stephens Convention Center in Rosemont Jan. 12-13, 2019. They both will likely have you drooling, wishing or planning. Chicago Boat, RV & Sail Show™ is not just about walking around and admiring boats or having “inchitis” to move up to a larger craft. See the seminars available to learn more about what you are already doing or hope to do. If you stop by sponsor Progressive’s Boat Club that is working with the Annapolis School of Seamanship you may get some tips on docking techniques (docking pool) and you can experience a Virtual Reality boating session. As to the travel aspect, Corona will be encouraging visitors to “Find their Beach) at its Beach Bar & Cantina to put you in a boating frame of mind. Then there is a booth to test your boating skills (A429) and a Build-a-Boat at Chicago Maritime Arts Center’s section for youngsters and adults. Or let the kids (age 12 and younger) fish for free at Huck’s Pond. Paddle board enthusiasts or wannabees can see demos and get how-to instruction while sailboat racing aficionados and hopefuls can try remote control sailboat racing or take a free sailing lesson with a simulator. For those visitors who envision traveling now that they are retired or want to travel with their possessions, there is the RV Info Center with models and experts to fit all needs. DETAILS: McCormick Place South, 2301 S Lake Shore Drive Chicago IL 60616., Jan. 9-13, 2019. Admission is free to age 12 and younger and $15 age 13 and older but save $2 by purchasing tickets online in advance through Jan,. 8. Senior Day is Jan. 9 to pay $10 for ages 62 and older. 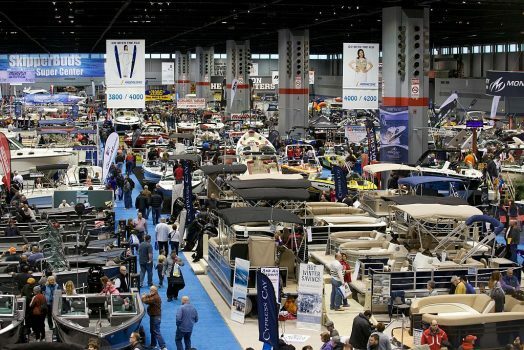 For hours, other information and tickets visit Chicago Boat Show. 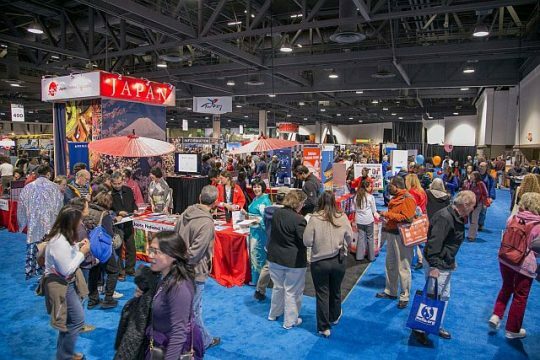 The Chicago Travel and Adventure Show is a chance to hear about vacation destinations from Africa, Asia and Australia to closer to home adventures in North, Central and South America. Visit and chat with exhibitors, hear travel experts and sit in on travel seminars. Some of the fun things to do are take SCUBA lessons in a dive pool and take a camel ride, really! There will also be a trip door prize and giveaways from many booths. DETAILS: Chicago Travel and Adventure Show is at the Donald E. Stephens Convention Center’s Hall F, 5555 N. River rd., Rosemont, IL 6001 Jan. 12-13, 2019.. Tickets are $15 for one day, $22 two days to ages 17 and older and free to children age 16 and younger. Tickets are available at a discount on line for a limited time. For hours and tickets visit Travel and Adventure Show.